Definitive stamps must portray an image of Canada for a wide variety of people inside and outside the nation. Canadian wildflowers are just the subjects to do this. The flowers reflect the magnificent beauty of our country. The 5� definitive presents a flower which is native to western Canada. The shooting star, a spring flower, grows from five to eighteen inches tall in woods, mountains and prairies. It can also be cultivated in well-drained soil. Heather Cooper, Toronto artist and designer, is a partner in the firm of Burns, Cooper, Donoahue, Fleming & Company Limited, internationally known for their fine work in the graphic arts. 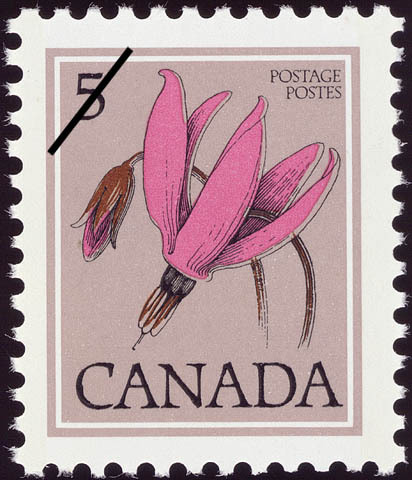 Her design for this definitive and her accurate rendering of that flower convey the grace and beauty of the subject within the confines of a small stamp size. The Latin designation for the flower appears in the plate-block inscriptions. This issue of definitive stamp use Cartier typeface, first cut by the Canadian typographer, the late Carl Dair. This modified version was specially prepared for the Canada Post Office for use on postage stamps. Canada. Post Office Department. [Postage Stamp Press Release], 1977.